I draw and paint and stuff. Hi! I'm Chuck, an illustrator living in Portland, OR. I’m halfway through my first semester at Academy of Art University. 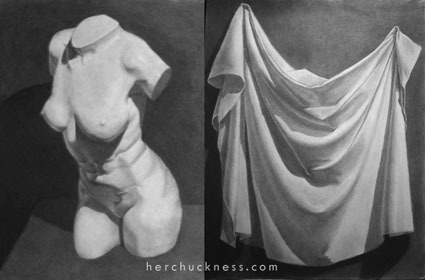 The drawings above are the two most recent assignments for my Analysis of Form class. I’ve taken a similar class before and so had a headstart on some of the concepts, but we’re quickly moving into new territory for me. I’m enjoying it – it’s making me stretch without being overly frustrating. I’m happy we’re starting to get into more interesting subjects too. Drawing cubes and spheres is certainly useful, but kind of boring to look at. I wasn’t entirely sure about art school before I enrolled. I debated with myself about it for an entire year before actually applying to AAU. It’s too expensive! It’ll take forever! I can learn just fine on my own! I’m glad I went ahead with it. I find the enforced habit of drawing several days a week and sticking with each drawing through completion even more valuable than the actual lessons at times. I have a bad habit of getting partway through a drawing or painting and then stopping, either through fear of messing it up or my attention drifting to something new. Having someone else tell me what to draw and when to draw it is exactly what I need right now.